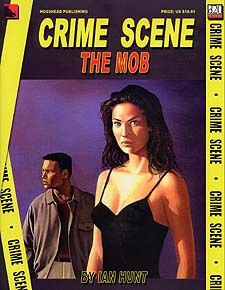 Crime Scene: The Mob tells you everything you need to know about the Mafia. First the facts: Mob history and organization the codes and initiations, the families and infamous personalities, as well as all the rackets and all the crimes. Then the rules: how to become a Made Man, how to run a Mob crew, how to rise through the Mafia ranks, and how to stay ahead of the Law and out of jail. This book creates a vivid and hard-hitting environment filled with lethal gun fights and fast-paced car chases, but it doesn't limit your mobster just to the streets. The game also provides a set of realistic yet easy to follow rules for creating, managing, and exapnding a Criminal Empire - be it through protection, drug dealing, gambling, or pimping. Players develop their rackets in the downtime between gaming sessions, using a system of Crew Development points. Crime Scene: The Mob brings La Cosa Nostra alive and kicking to your dining table. So grab some linguini alla neapoletana and your best designer suit and let's get down to Business. This game makes an offer you won't want to refuse.